It seems like there is nothing cauliflower can't do. With its mild flavor and versatility in preparation, it is has become a favorite substitute for carby foods like bread, rice, pasta, potatoes . . . you name it, cauliflower has been substituted in it. Substitutions can either hit the mark or just make you miss the original ingredient, but in the case of this recipe, the cauliflower substitute is every bit as good as the original. Maybe even better. 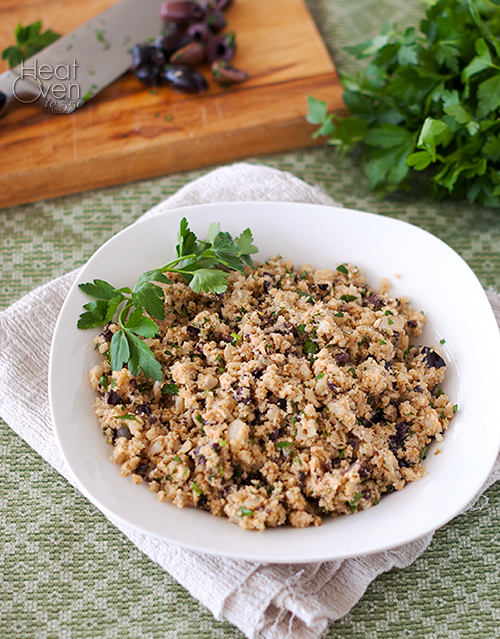 The cauliflower florets are chopped finely in the food processor, giving them a light texture like couscous, and then browned in a skillet until they develop a sweet, nutty flavor. 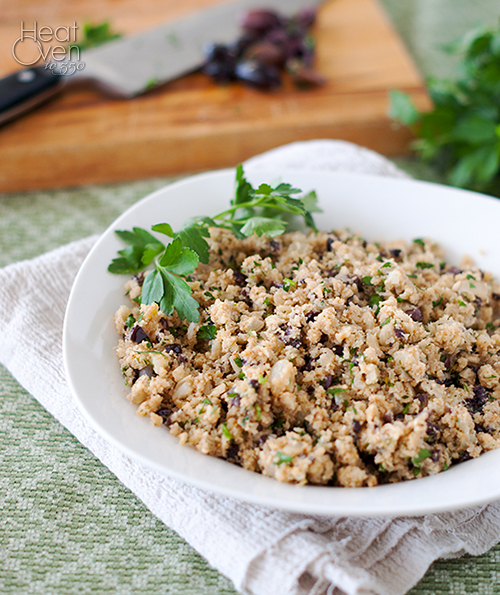 Throw in some classic couscous ingredients, like kalamata olives, garlic, lemon and parsley and you've got a cauliflower dish that is light, fluffy and delicious. And hard to stop eating. I feel like every time I discover a great cauliflower dish I feel like it is my new favorite, and this one is no exception. Whether you want a healthy alternative to regular couscous or just a great-tasting side dish, this recipe deserves a try. Working in two batches, add cauliflower to a food processor and pulse until chopped into very fine pieces, about the size of couscous. Heat a 12" skillet over medium heat and add olive oil. Stir in onion and garlic and cook and stir 2 minutes. Add finely chopped cauliflower pieces to skillet and stir to combine. Cook over medium-low heat for 40 minutes, stirring every five minutes or so to prevent burning. Once cauliflower is golden and developing a nutty flavor, remove skillet from heat and stir in kalamata olives, parsley and lemon zest. Season to taste with salt if needed and serve. I'm with you -- cauliflower can do no wrong. It's great raw, roasted, as a steak, or this version -- which I need to try! It looks amazing! I think frozen cauliflower might be a little too wet when you thaw it out to really cook in the pan and not steam instead. I'd go with fresh if you can.